We understand that not all collection agencies are the same and so we offer two different payment portal options for different levels of integration. Our basic payment portal comes with all of our merchant accounts to allow your office to accept single payments for any amount. For a more customized and user friendly experience, our real time portal solution will allow consumers to see the exact balance they owe or set up a payment plan without ever needing to pick up the phone. Find more details about our various payment options below or contact us for more information. Ask us about custom integration with your Proprietary Collection Software. If your collection software has a way to get at your data from an outside application, we can almost always integrate with your system - even if it's not currently supported. We spent months talking to collection agencies about what they valued to craft the perfect online collections payment portal. We studied existing collection payment portal solutions to see when, where, and why users wouldn't complete the payment process. With this detailed research information, we designed and coded our own collection payment system that is easy to use and a fresh, modern, professional user interface. Capability to integrate with whichever collection software solution you use. Show live account balances in real time so the consumer pays the actual balance and not the old balance. Automatically post web payments back to your collection software so you're always completely up to date. Allow the consumer to create automatic reoccurring payments to promote full payment amounts. Give your debtors the option to create their own customized payment plans on your approved terms. Use your existing website and branding on the payment portal to create confidence and trust with your users to encourage them to submit payments. Meets all Regulation E Compliance rules. Our basic payment portal comes standard with any of our high risk merchant accounts. The basic payment portal is a simple payment form that payments to be made for any amount with an account number. The basic payment portal does not display any kind of balance information. Each portal comes with the standard grey/purple option shown but we are happy to offer professional design integration with your existing website and company's branding. Additionally, our payment portal does have an API available for developer integration directly into your website. Capability to make a single payment for any amount. Straight forward and user friendly. 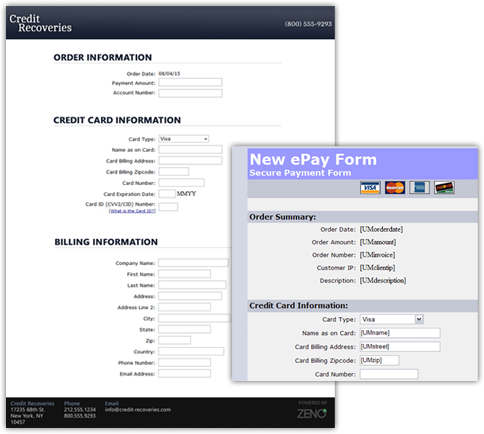 If you're ready to start accepting credit and debit card payments online, or you're interested in integrating your collection software with our customized payment portal, Zeno Payments may be able to help you.